I did not make this, but it was so cute that I had to post! My cousin Robyn is one of the most amazing, creative people I know, & she's able to sit down and just figure things out by looking at them. 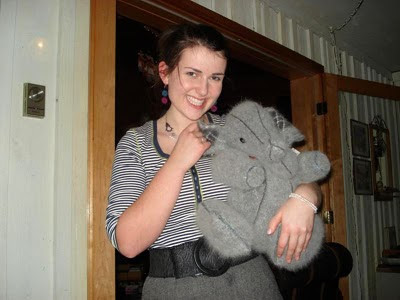 She whipped up this stuffed elephant, from an angora sweater, for her daughter without a pattern. It was so soft and adorable that I couldn't help but hug it! Last spring I took a needlefelting class. We made stuffed animals. I chose to make a pygmy goat & an owl. The base for the goat is mostly foam, so he's lighter than he looks! I still don't have a name. Any suggestions? They're needlefelted & then wet-felted & then all details are needlefelted. I'm actually really excited about the goat. He's such a handsome feller. I LOVE THESE!!! That little owl is hilariously adorable!!! !